Last July the Press Office in Hammersmith and Fulham’s Conservative run council contacted the local Chronicle newspaper and demanded a retraction. 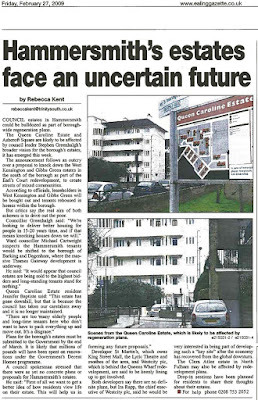 The paper (click on the articles to view) had scooped a story that the Conservatives planned to knock down 800 residents' homes in West Kensington. There was no retraction and five months later the Council now freely admits that it has been engaged in extensive talks with the developers of Earls Court to – you’ve guessed it – knock down 800 homes in West Kensington and replace them with offices, hotels and luxury apartments. I suppose you have to admire the Administration’s chutzpah for ever trying to deny this was so. Earlier that year, over in Hammersmith, residents on Ashcroft Square had heard rumours that their homes were also being offered to property developers. So, on 30th January 2008 a member of the Ashcroft Square Residents’ Association attended the Council Meeting to ask what was going on. The Conservatives explained that there were “no firm redevelopment plans” at that point (click here and type in page 21 to read the full exchange). We have now learnt from the Council that it has in fact been in talks with St. Martins Property Corporation, the Kuwait owned property developer, about “redeveloping” Ashcroft Square which would involve getting rid of many of the affordable homes in that area. On top of all of this, it now turns out that, despite earlier denials, H&F’s Conservative Administration has confirmed that it has been in talks with property developers about “redeveloping” the Queen Caroline Estate as well – also in Hammersmith. There was a meeting three weeks ago. The Tory Administration invited members of the residents’ associations for the two Hammersmith estates along with Hammersmith Broadway’s Labour councillors. The meeting went so badly that one leading resident association representative for the Queen Caroline Estate left the room in a highly upset state accusing the Conservatives of trying to “move people like her out of the borough”. It is clear that there is a pattern here. We have received confirmation that the Conservative Administration has had talks with developers about "redeveloping" homes on the Lytton Estate and in White City as well as those already mentioned. Regular readers will recall that last year a leading Conservative Councillor and two council officers flew to Cannes on the French Riviera to meet international property developers. The explanation given for the tax-payer funded trip was that they hoped “to unlock contentious development sites” in the borough. There has have been lots of contentious development sites in our borough over recent years. The Hammersmith Grove Armadillo, the Goldhawk Industrial Estate along with all the people's homes mentioned above. If the Council has nothing to hide then it must come clean and let residents know which sites were discussed while in the luxury resort, which property developers they met and exactly what was offered to them by our council representatives. They must let residents know exactly what they have planned for their homes and our borough. The Tories' vision for Hammersmith and Fulham seems to involve building Wandsworth style super property developments across our borough. That would certainly make H&F Council a lot of money but it's highly questionable whether our current residents will agree to give up their homes or have their neighbourhoods blighted by such schemes. The Conservatives have said that they want to re-house those people whose homes are demolished. The question is where? 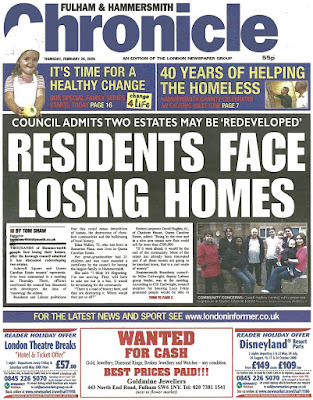 Given that it is H&F Conservative’s policy to no longer build affordable housing for rent; that it has cut the numbers of low-cost homes to buy; and that they now sell vacant council homes situated on residential streets instead of re-letting them to people on the waiting list; then there is much less local affordable housing to buy or rent that is now available. It would therefore be impossible to re-house all the thousands of residents that would lose their homes in this borough. Residents have legal rights and it's important that people know what they are and how to use them. My Labour colleagues and I will work with those people affected. Please feel free to contact me for help by clicking here. Or call me and my fellow ward Councillors, Lisa Nandy (Labour’s shadow housing spokesperson) and Mike Cartwright (Labour’s deputy leader) on the number at the top of this page. 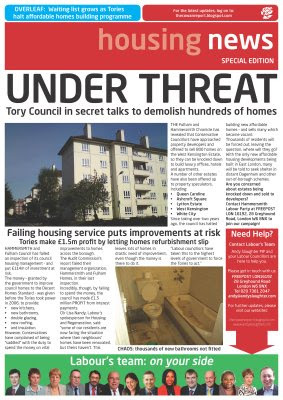 Meanwhile, please click onto the attached local newspaper cuttings and our housing newsletter for more details. Well we council tenants have been treated as 2nd class residents within the borough so there will be no "sleepless" nights for the Tory councillors - there homes will not be at risk so "they're all right Jack!". Decent Homes is a mess both in its progress and actual delivery. Since it was undertaken here we have suffered water leaking into the bath room and the council have been "fixing this" since last October. Before we had no such problem. Will these re-developed estates, with the removal of tenants to far flung outer areas of London provide the voting cohort to get Shaun Bailey in come next election? Labour need to win Hammersmith and Fulham next election. You need to get Hazel Blears to stop this happening or people be homeless.